Umko 8 is a beautiful, self-catering, holiday home with a separate garden cabin situated in Umkomaas. This property can accommodate up to 8 guests in the 3 bedroom setting with 2 bathrooms. We are fully equipped for a relaxing beach holiday and only a 2 minute walk to the beach. The property has an alarm system and is fully fenced. 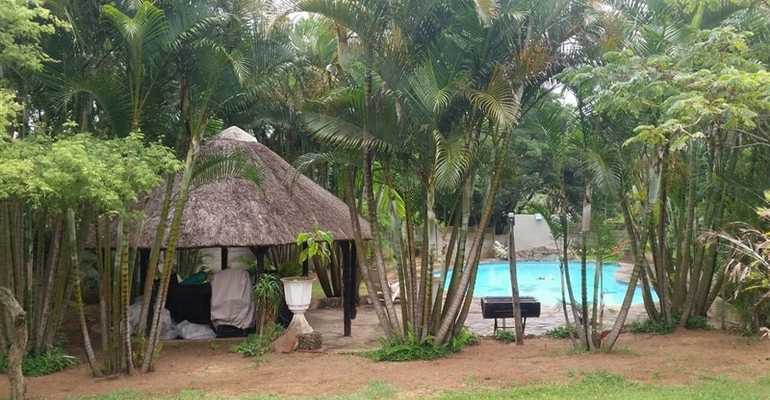 The yard also boasts a huge garden with lapa, braai facility’s, swimming pool and bar area. Domestic service is included for your comfort to keep the accommodation clean and comfortable. All Linen is supplied but please remember to bring your own beach towels. In the immediate area, you can find restaurants, take-aways, and many more entertainment options to choose from. Umkomaas is only a 35 minutes’ drive from Durban and within a comfortable driving distance to many well-known destinations such as U-Shaka marine world, the Casino, Gateway Shopping Centre and Croc world. Starting from R2500.00 per night. Please remember to bring your own beach towels. Deposit of 50% to secure dates and balance to be paid 30 days prior to arrival. Additional Breakage fee will be charged.